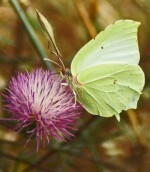 A wonderful few days for butterflies, including two that are new to this blog. Most were familiar ones and most were not numerous, but several different species were represented none-the-less. Friday (27th) was an exceptional day, hot and sunny with very little breeze and I saw more butterflies in one day than I think I’ve ever seen here in this garden. 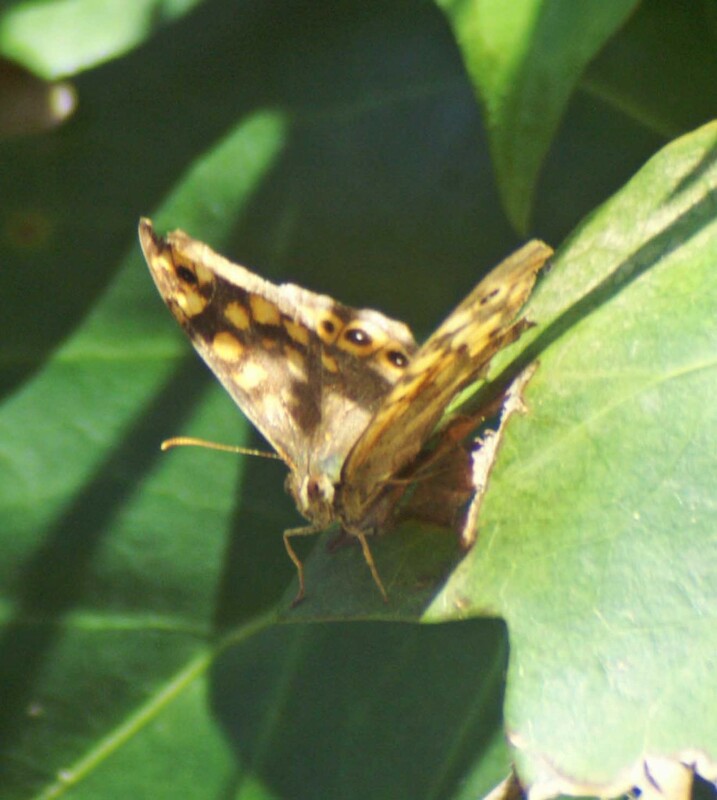 It’s only right that I start my list with a Speckled Wood, our most consistently-present butterfly, which has been particularly numerous this week. I’ve seen them all over the garden, in dappled shade, in full sun, fighting amongst themselves and chasing off other intruding species. 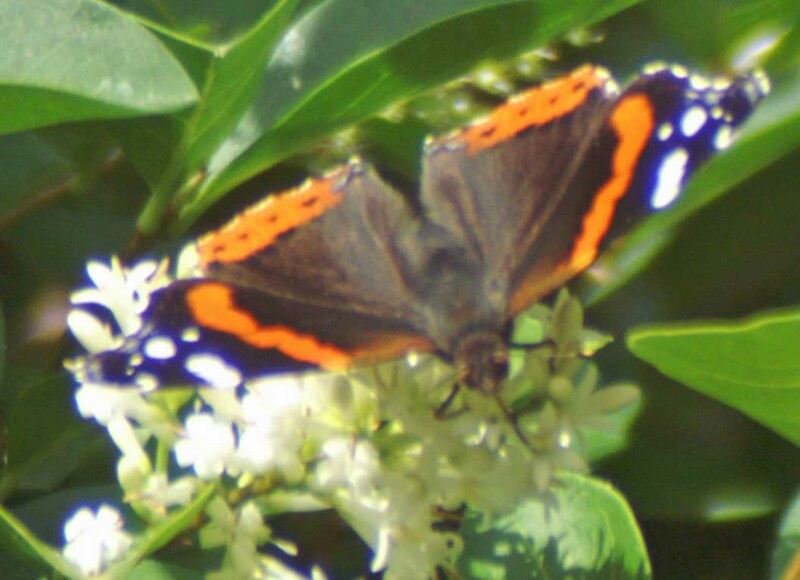 They’ve also been taking nectar from the privet, and one I saw, from thyme flowers. There is always one in the part of the garden on either side of the entrance gates that regularly patrols the shrubbery and hedge, defends its patch vigorously and takes siestas on ivy leaves, so I chose to photograph him. 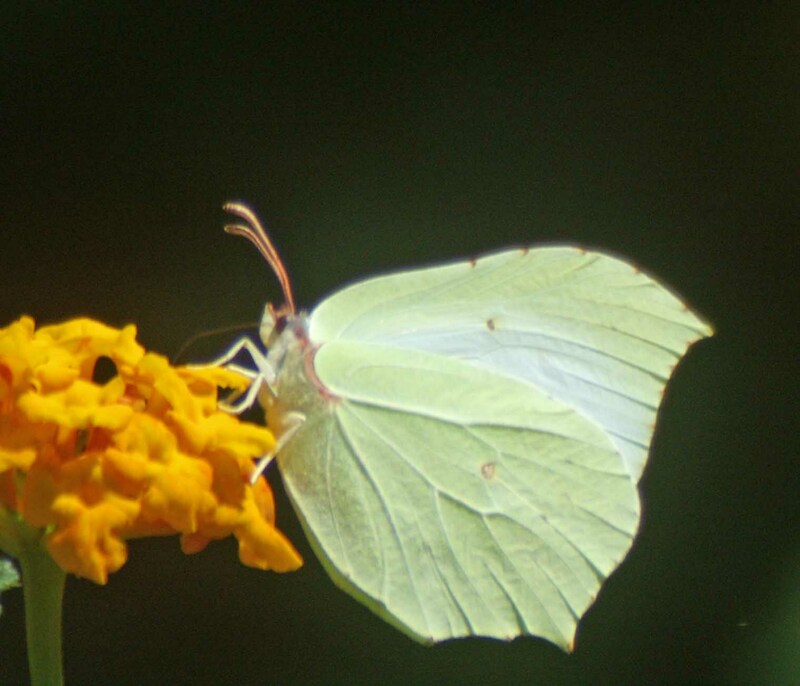 On Monday I caught sight of what I thought was a Large White dipping down to flowers at the bottom of a lantana shrub. It was a lovely female Cleopatra that was so perfect it must have been newly emerged and that stayed feeding for at least half an hour. 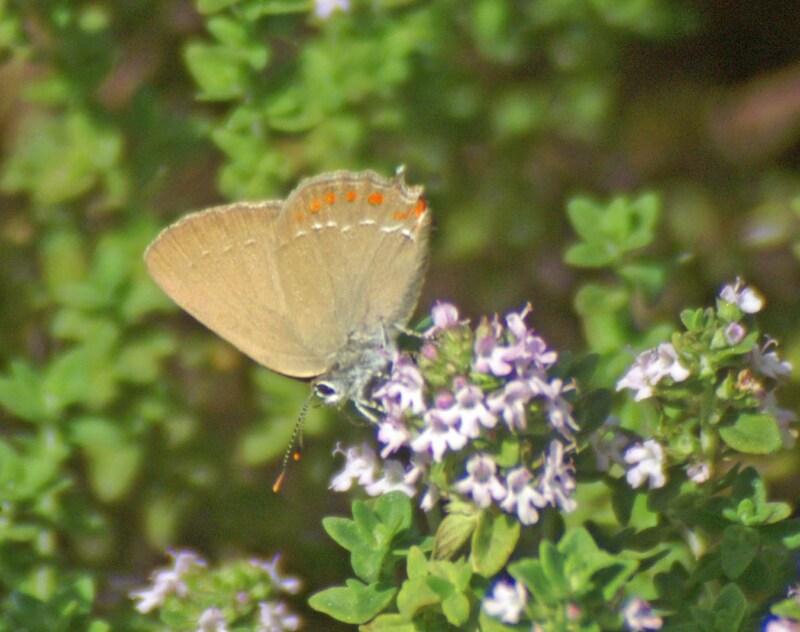 There are a mass of flowers on my thyme plant now that have been attracting a few little hairstreak butterflies. 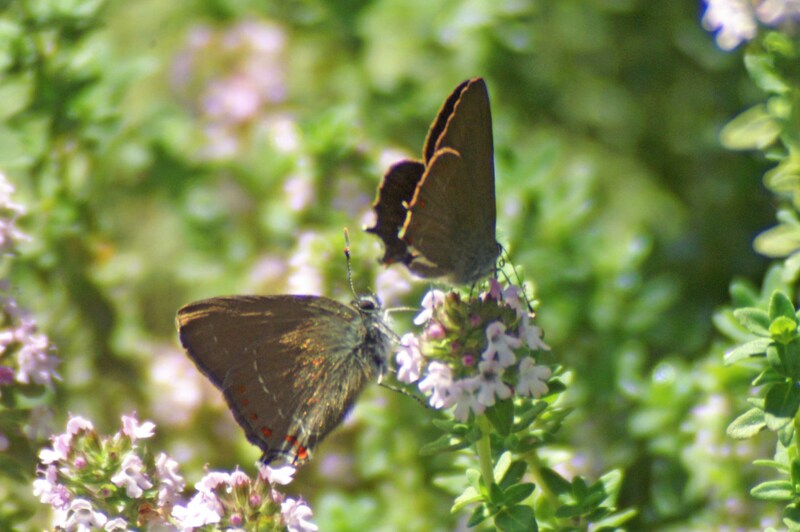 These are Ilex Hairstreaks that I have seen in the garden in ones and twos in previous years, when they have been attracted to the yellow button flowers of the santolina (cotton lavender). I have not had a very good look at their uppersides as the second they land they snap their wings shut. I have seen individuals moving their hindwings back and forth, passing one over the surface of the other, giving glimpses of only the edges of the upperside surfaces of the wings. I’ve seen this behaviour in other species too and have wondered why they do it. I’m sure it will be something to do with mating; maybe the change in air current it makes wafts pheromones into the air, or makes some kind of high frequency sound audible only to another butterfly. Maybe it lowers their body temperature a little, circulating air around their furry bodies. Whilst photographing the hairstreaks a little blue butterfly passed close by and landed on one of the little yellow flowers that populate an area of my lawn. A male Common Blue. 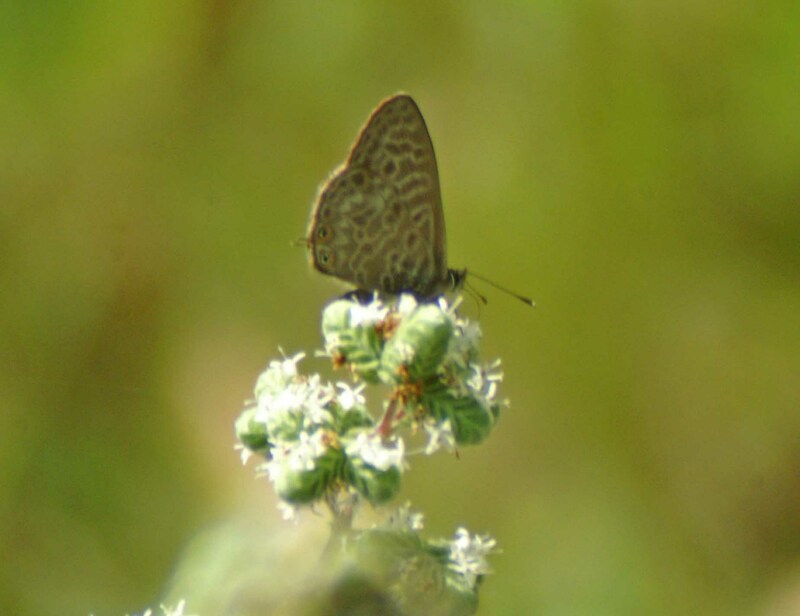 I came across another blue that had dropped in to sample the marjoram flowers, this one a little butterfly that originates from Africa but that is a common migrant here and may have become resident, a Lang’s Short-tailed Blue. 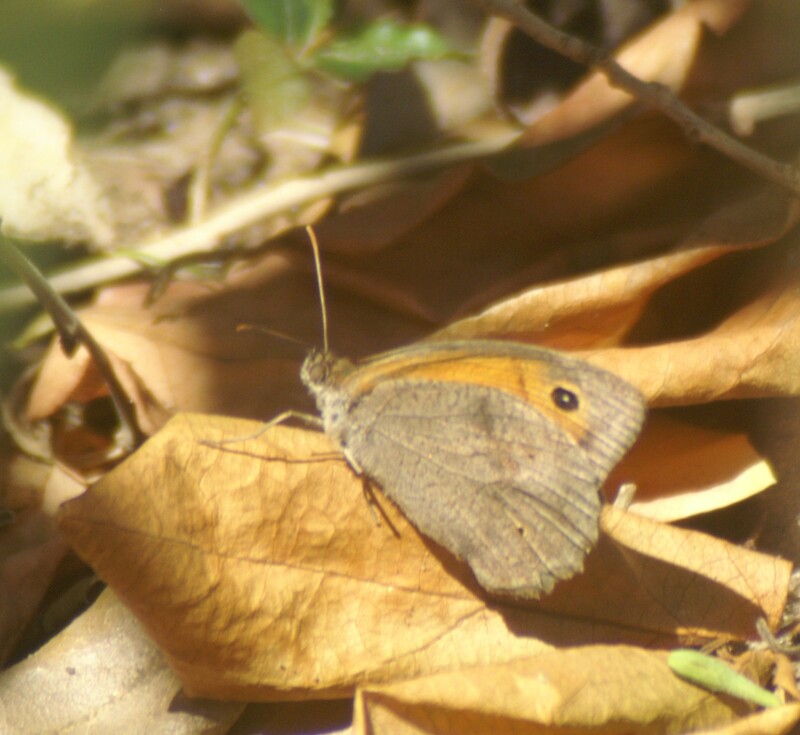 A butterfly I was surprised to see was a Meadow Brown. 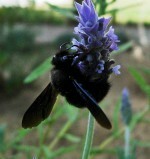 It was flying very low to the ground in the shady strip of garden between the boundary wall and the house, pausing to rest first on a violet leaf which it was probing with its proboscis and then on a dry leaf on the ground. Other species I saw but did not/could not photograph were Small and Large Whites, almost constantly on the wing and too fast for me, clearly energized by the sunshine. Holly Blue(s) that I have had several sightings of as it fluttered along the tops of the hedges then up to the tops of the trees. A Clouded Yellow that popped in over the wall, raced along the hedge then popped back over the wall. 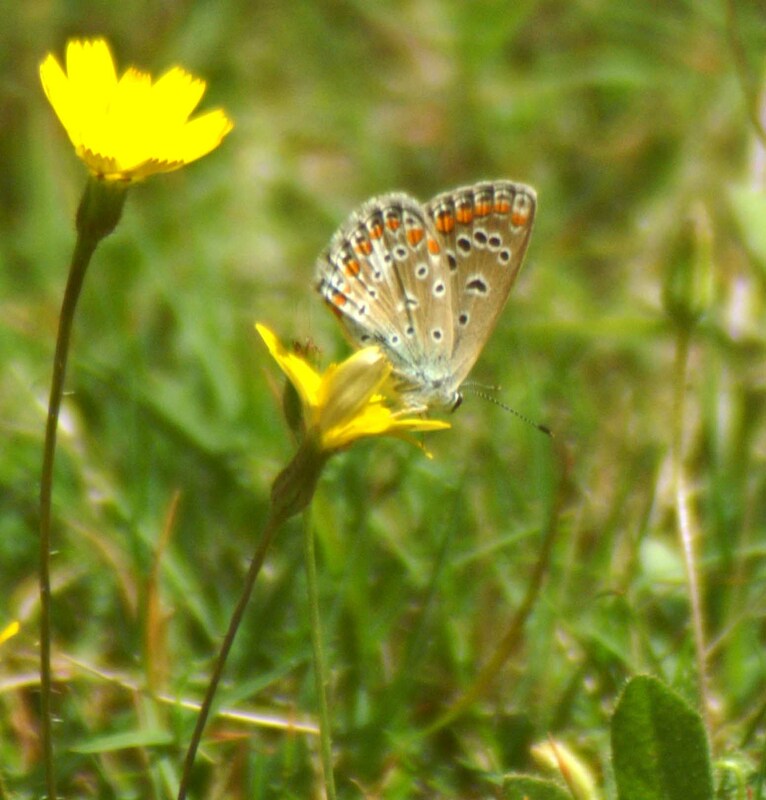 This entry was posted in Butterflies of Southern Spain, Nature, Nature Photography and tagged Cleopatra butterfly, Common Blue, Ilex Hairstreak, Lang's Short-tailed Blue, Meadow Brown, privet blossom, Red Admiral, Speckled Wood. Bookmark the permalink.